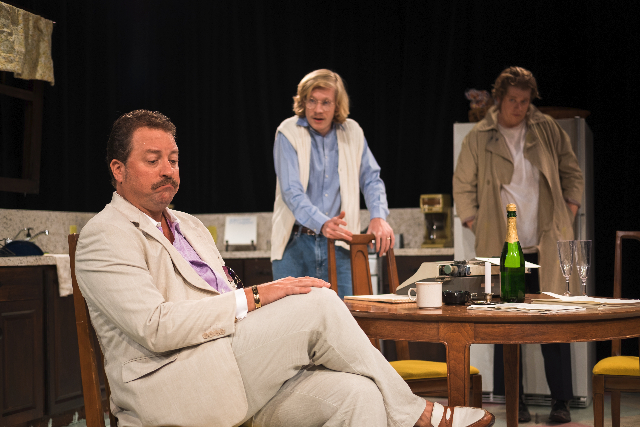 In the wake of Saturday’s white supremacist rally and destruction in Virginia, Ft. Lauderdale-based New City Players’ production of Sam Shepherd’s True West serves as a striking example of art reflecting a terrifying reality that seems surreal. One scene bears a frightening similarity to the kind of force and violence a shocked nation witnessed on the news following Saturday’s violence. In the scene, a burly, disheveled Timothy Mark Davis, unrecognizable as drunken drifter Lee, barrels across the stage like a runaway bulldozer or tank. After he’s through destroying the southern California home in which the play is set, the residence (designed simply and compactly by Ryan Maloney, but lit with little variety by Joel De Sousa) resembles a warzone. The late Shepherd, who died recently of ALS, wrote in a brutal, surrealistic style. It can awaken us to the unsettling reality of today’s divisive world. 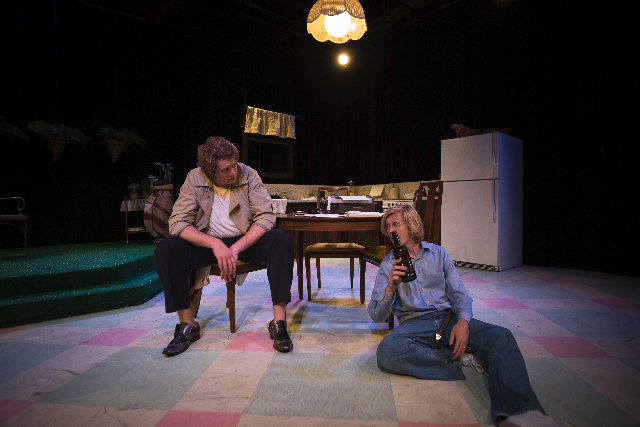 The final scene of True West, played with quiet menace by Timothy Mark Davis and Andrew Paul Davis, is a stark reminder that we’re living in such a world. The actors’ respective characters are in a fighting stance – and it appears the battle won’t be over until one of them is dead. Just as the play ends without anything resembling a happy or satisfying conclusion (the play ends with the characters in the midst of fighting), we’re reminded that the problems of the world in 2017 aren’t nearing a resolution. Shepherd’s plays aren’t meant to make us feel good or comfortable. Throughout his long and illustrious career, he has sought to spotlight the darker aspects of family life and other aspects of existence. With his use of prolonged pauses, Shepherd, like playwright Harold Pinter, includes moments of silence to convey a sense of tension -- and a hint that violence can erupt like lava at any moment. Under Mary Elizabeth Gundlach’s direction, the pauses in Shepherd’s script convey palpable unease. It contrasts markedly with the peaceful sound of crickets in the background. The moments of silence, however, are periods of calm compared to the storms of fury unleashed when Lee grows frustrated. Timothy Mark Davis, New City Players’ producing artistic director, is likely a familiar face among theatergoers who regularly attend the company’s productions. You’d never know it was the pleasant-spoken man sporting the disheveled hair, dirt-streaked trench coat and long sideburns fully inhabiting the role of Lee. He leans forward in an appropriately aggressive posture and his thunderous voice explodes with menace and fury. Lee repeatedly and viciously slams a golf club into the ground in keen frustration. In the process, he’s working himself into such a frenzy that you fear the actor will hyperventilate. 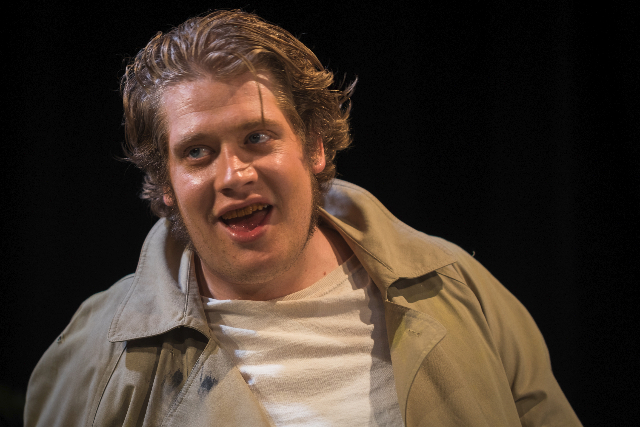 When he’s not playful, his Lee is a cross-between a primitive beast, a man-child such as Lenny in Of Mice and Men and a mental patient who hasn’t eaten, drank or taken his medicine in months. The source of Lee’s frustration stems from his encounter with movie producer Saul Kimmer (a polished and patient John Holley). Kimmer is working with Lee’s brother, Austin, on a script. The brothers’ mother is vacationing in Alaska, and Austin is temporarily living there. The play opens as Austin is hard at work on his screenplay. Lee has already barged into the home, taking a break from his wanderings in the desert. He’s downing bottles of liquor like an athlete thirsty after practicing for hours in South Florida’s heat and humidity. As Austin’s head is buried in his work, Timothy Mark Davis excels as an unsteady Lee, with a semblance of a swagger, casually and playfully talking with and teases his brother. Curiously, Lee speaks in a southern accent; Shepherd never mentions that Lee hails from the south. The accent might be a directorial choice made while Gundlach and Davis contemplated Lee’s backstory, suggesting his fascination with the wild west stems from his roots in Texas or nearby. The play’s title stems from the question of whether Lee’s notion of the west, complete with guns, horses, bravado and chasing scenes from movies, exists or is merely a myth. In contrast to Lee’s casual nature, Andrew Paul Davis’ Austin suggests a studious, nerdy scholar who most often buries his face and head in his work. When Austin learns the producer is no longer interested in his script, however, his reaction doesn’t convey enough shock. But it’s not long before Andrew Paul Davis’ Austin, in chameleon-like fashion, transforms from composed worker into boisterous, unsteady intruder. Lee, meanwhile, becomes the hard at-work screenwriter tending the house after the producer announces that, instead of Austin’s romantic film script, he’s interested in Lee’s idea for a screenplay. It depicts the wild west according to the myth ingrained in many of our minds. “You wrote a screenplay?” the siblings’ mother (a curiously mellow, unperturbed Lory Reyes) asks Lee after she arrives back at the mayhem-filled home, obviously thinking he’d be the last person to do such a thing. Latent desires or personalities likely lurk within us. As Shepherd hints, they might not become manifest until a trigger causes them to pop out. In this case, the trigger was Lee meeting the screenwriter. The two begin talking and Lee mentions he has an idea for a movie. Just as we have dual natures, productions of plays often have different qualities, some good and some weaker. The staging needs work; New City Players’ home, the Vanguard in Ft. Lauderdale, contains an intimate playing space with the audience seated in the shape of a right angle. Too often and for too long at different points, the actors aren’t positioned so that everyone in the theater can clearly witness their facial expressions. Staging a play in a non-proscenium theater can be tricky. Periods will exist when some audience members will only see the backs of actors. Those moments, however, cannot last for too long. True West contains symbolism and motifs, including the noise produced by coyotes outside in the distance, yapping as they lure a pet to their area to kill it. The animals and the noise they produce symbolize the ferocious battle inside between Austin and Lee. The coyotes and their noise, overdone somewhat in this production, can just as easily symbolize the dangers we face in our world today. New City Players’ production of True West continues through Aug. 27 at The Vanguard Sanctuary for the Arts, 1501 S. Andrews Ave. in Ft. Lauderdale. Show times are 8 p.m. Thursday, Friday and Saturday as well as 2 p.m. Sunday. Tickets range in price from $20 to $35. Visit www.newcityplayers.org or call (954) 591-0818.